Every year, one of the most asked questions we get is "why should my student do band over another elective?" Well, there are a lot of reasons. 1) Music is a discipline that uses all parts of the brain, and is a cognitive and creative activity. It's no secret that students who partake in one or more of the arts are more well-rounded students, and more receptive to other kinds of learning. You only need to look at the top of the student ranks here at OHS. 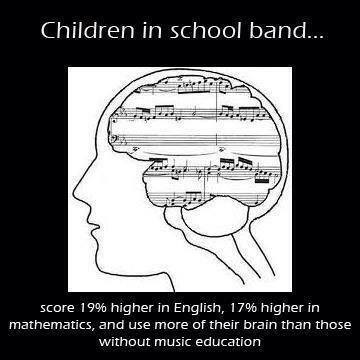 There are roughly 450 students in the music program, about 17% of the school. Yet, year in and year out, at least 50% of the "Top Ten" (top 10% of the graduating seniors) are music students. This includes valedictorians, salutatorians, and in some years, both!!! 2) Colleges love seeing music classes on a student's resume!!! Music and the fine arts are part of a well-rounded education, and colleges and universities look for that when assessing candidates for their institutions. Check out this listing of what Illinois colleges expect of their incoming freshmen...most require fine arts or a foreign language. Many people operate under the assumption that the arts need to be dropped in favor of a foreign language, and that is just not the case.